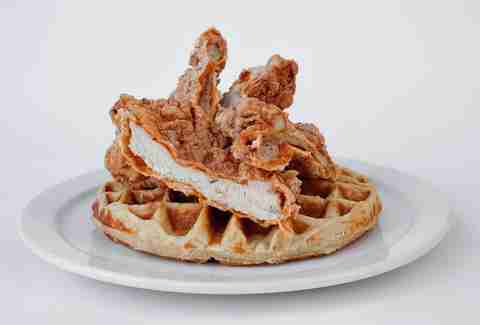 Chicken and waffles may seem like such a simple Southern thing until you’ve tried it at 24 Diner. For 24 hours a day, dine on chicken that’s crispier, yeast-risen waffles that are fluffier, and Vermont maple syrup that’s sweeter. Add brown sugar butter and gorge. 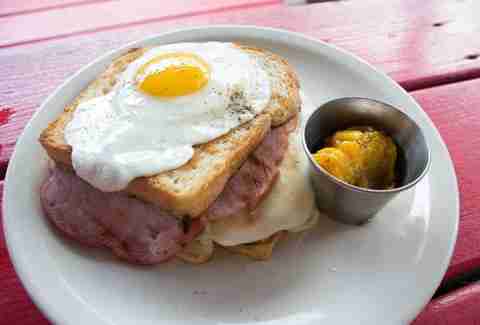 Made with oozy béchamel sauce and glorious Gruyère cheese, Whip In’s croque madame is your typically delicious French breakfast sandwich save for one thing: the optional side of sweet mango chutney loaded onto a fried egg, which is just the (metaphorical) cherry on top. 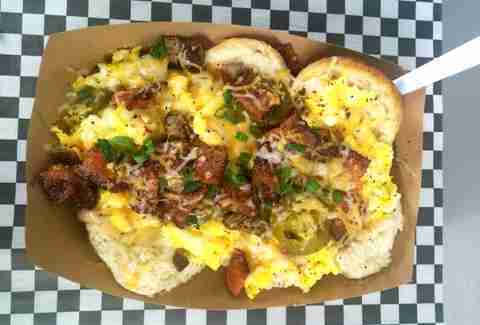 In this day and age of excess and gluttony, it’s no longer enough to just smother your biscuits in gravy. Leave that to dieters. Instead, pile on the jalapeños, the maple bacon, the eggs, the sausage, the cheese, and the chives and understand that this is just how things are done in Texas. How to improve upon an already classic Vietnamese sandwich favorite? Serve it for breakfast. 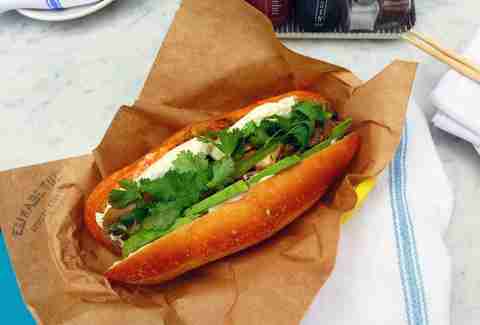 Elizabeth St Cafe makes that dream come true with all the original trappings of a bánh mì plus the option to switch out traditional pork belly for pork sausage and the choice between eggs scrambled or fried. For dessert? A chocolate eclair, of course. Tucked underneath an egg trumped up with Dos Lunas cheese peek turkey, home fries, and tomatoes ready for the eating. 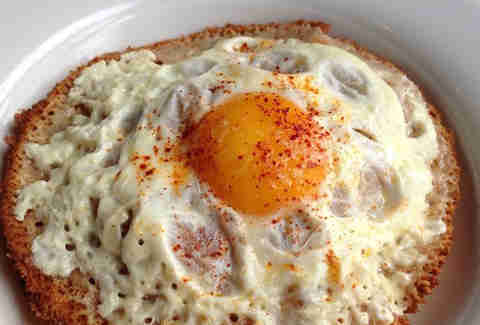 Tucked deep, deep down in your subconscious peeks a secret resolve to never eat eggs without Dos Lunas cheese again. The whole point of being a grown-up is being allowed to scarf down poached egg over Fritos, chèvre, queso, and chopped beef at 11am. 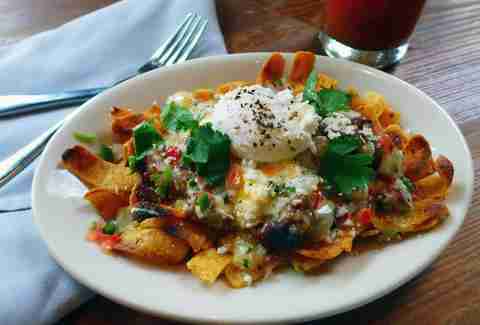 Frito pie for breakfast? Don’t let anyone tell you it can’t be done. 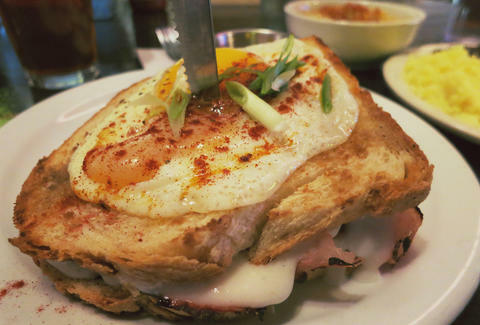 French toast is always a fan-favorite and Winflo Osteria’s Italian iteration doesn’t disappoint. The standard six slices of challah bread are best used as tiny vehicles for the surplus of powdered sugar, cocoa, and syrup, as well as a healthy dollop of mascarpone cheese. Toast is the hallowed breakfast staple that so often gets overlooked for its French brethren, but Josephine House makes a version capable of standing on its own. 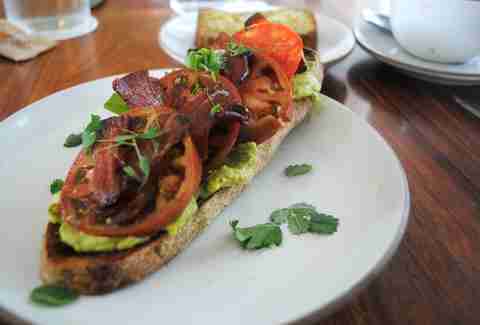 With avocado, heirloom tomatoes, bacon, and aioli piled high on top of walnut sourdough, you won’t be quite sure how to eat it, you’ll just be sure that you want to.